If you own a rare DVD of your favorite film, which is filled with extras like director’s commentary and exclusive behind-the-scenes footage, it would be a shame to lose it due to physical damage. With a program like Handbrake or WinX DVD Ripper though, you can ensure that everything on that disc is backed up and ready to be viewed not only on your computers but also your phones and tablets. This will enable you to digitally convert your entire DVD shelf into files that will forever be safe for your consumption on your hard drives or smartphones. The main purpose of such programs is to let you convert your DVDs or ISO images into MP4, H.264, AVI, HEVC, MPEG, MOV or M2TS files. Handbrake is a free and open source tool for Windows, Linux and Mac operation systems that easily lets you convert your DVDs into digital files. It holds the ability to convert your DVDs into a large number of formats in various different resolutions. And there are plenty of other features present in this program like subtitle support, title/chapter selection, VFR and CFR selection and more. However, there’s something important that Handbrake lacks – the ability to rip copy-protected DVDs. That’s where a program like WinX DVD Ripper triumphs. Any 99-title disc with DRM protection standards like CSS, ARccOS and others can be copied by it. And it also benefits from level-3 hardware acceleration which takes advantage of the CPU and GPU both, to deliver a 50 percent boost in speed. Handbrake comes with a pretty bland interface. Once you’ve inserted the DVD into the slot, you can click on the Source icon in the program to have it load the files. Once that’s done, a list of all the chapters present inside the DVD is rendered for you. You can then choose the output format and other little details before hitting the Start Encode button, to have your files ready for preservation. However, if your DVD happens to be copy-protected, this program will be able to do nothing about it. The WinX offering is able to bypass the limitation with its strong set of tools. This free DVD ripper has an attractive interface with clear icons meant to let you easily convert your DVDs into MP4 files. A neat little tutorial has also been posted on its start screen to get you started. If you have loaded your DVD, you need to click on the big DVD icon to start the proceedings. Right beside it sit icons meant for loading ISOs and folders if you so desire. Now comes the time to select your output format from the extensive list that is provided to you. 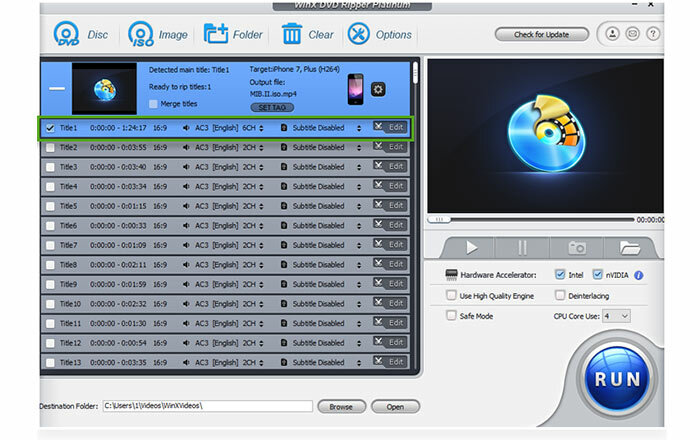 Not just MP4, but you can have your files converted into a variety of formats in different resolutions. Presets for various devices make your job easier by handling the little settings for you. So if you wish to watch your converted files on your Android smartphones, selecting the right preset will convert your DVD into exactly the kind of file needed to work on your handset. After you choose the format, an extensive list of all the chapters in the DVD is rendered before you, with the main chapter selected. If your DVD has subtitles, you can choose to have them embedded into the resultant MP4 file. There’s an edit icon next to each chapter, if you only want particular parts of your DVD to be extracted. This saves the time the software will take to convert your entire DVD into a new file. Once you’re done with the settings, one thing to remember is to have the boxes next to Hardware Acceleration ticked. Like we said before, the level-3 hardware acceleration of this program ensures that your files are converted into MP4s within almost half the amount of time than they would normally take. Hence ensuring that these boxes are ticked is pretty important. Pressing the big blue Run button is the only thing that’s left to do now to have your output file ready for storing in your hard drive. So while Handbrake is a neat and feature-rich tool to convert DVD to MP4, there are several clear advantages to WinX DVD Ripper that indeed cannot be ignored. Prime among them is support for ripping copy-protected DVDs. So whether they’re your special Japanese DVDs or region-locked 99-title DVDs, everything is convertible with this program. Another advantage is the presence of level-3 hardware acceleration, which saves a lot of your time. You can get DVD ripper free from the WinX DVD homepage, but you’ll need to pay if you wish to use all of its features. A one-year license costs $29.95, while a lifetime license costs $47.95.